Bottlecap crochet was a thing? How did I miss that? At the October Sage Farm show, one dealer had a big stack of these hot mats, in two sizes, shaped like bunches of grapes. Grape hot mats. Big aluminum tray in a grape leaf pattern. Some things are just made to go together! I thought they were made of crocheted puffs that were stuffed with fiberfill or something. And then I picked one up. Turns out these hot mats are made with metal bottlecaps, of all things. 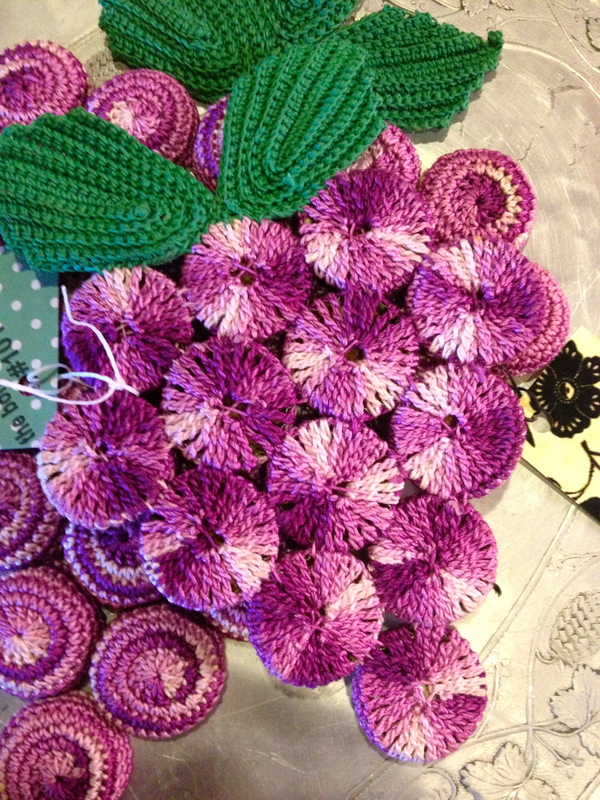 You crochet a little circle, tuck in a bottle cap, gather the crochet circle tightly, and then sew the motifs together. Kind of like 3-D quilt yoyos, if you know what they are. 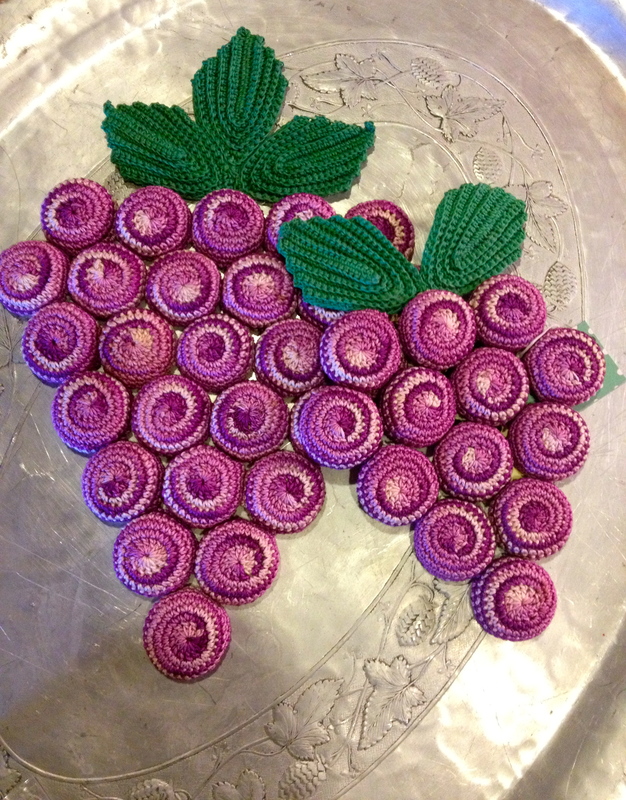 Add the crocheted leaves and you’ve got a cute bunch of grapes to protect your table. Or just to look fab in your kitchen. Here’s the reverse of the smaller mat, showing how the crochet stitches are drawn tightly together. Isn’t that variegated purple yarn the perfect choice for this project? I never heard of this crafty recycling before! Thirty seconds of googling turned up the 1953 original pattern. Hooray, it calls for a favorite old yarn: J.P. Coats’ Knit-Cro-Sheen. Now to find some in the right colors! And a bunch of clean bottle caps, too. 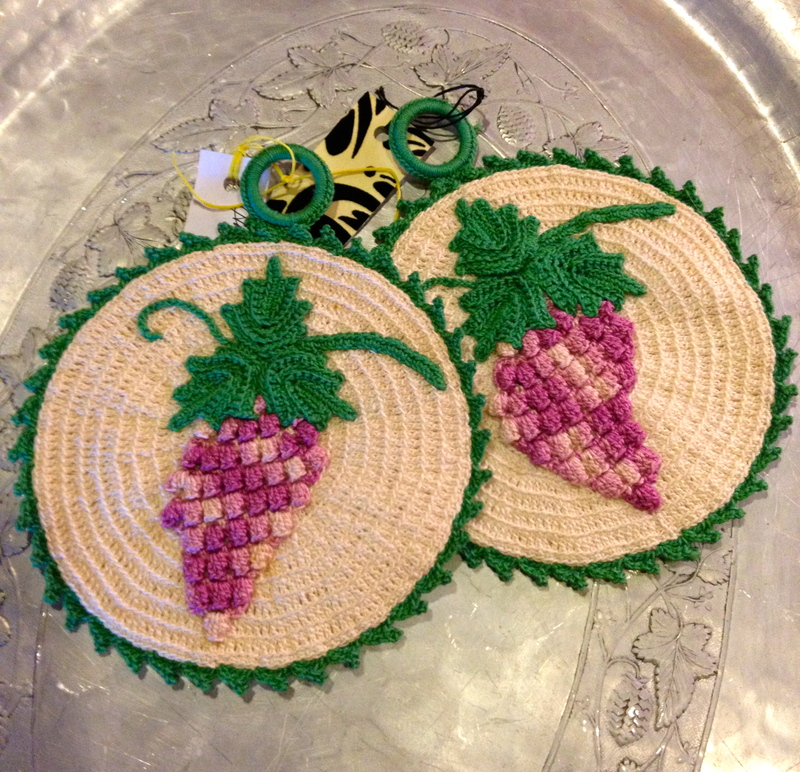 The dealer also had a couple go-along pot holders in the same green and variegated-purple yarns. No bottle caps here! It looks like these bunches of grapes are made by crocheting a very long, skinny strip in the purple, and sewing it down in 3-D loops. I haven’t found this pattern yet. These must have been leftover stock from a church or school bazaar. Are you old enough to remember those? Tables and tables of all sorts of handmade, useful little things, sold for a dollar or two each to raise money. Wonder what else is out there for bottle cap crochet? Did you buy them or just take photos? They’re wonderful! i would like to buy some from the dealer that had them. can you email the contact info? Gary, give me a day or two—I know her but I don’t have her contact info right at my fingertips. Thx. I DO remember church bazaars, and crocheted toilet paper covers–particularly one that looked like a leprechaun’s hat and one that had a doll in the center–the toilet paper cover formed her skirt. (I longed for that one!) Love the bottle cap crochet mats. Oh yes, I remember as a kid wanting one of those dolls, too. Because they had DOLL heads and arms! Now I’ve come to think that anything with only *part* of a doll is kinda creepy. 🙂 I’d take the poodle instead! I agree! I don’t want to feel those doll eyes staring….